How can I see how many people have viewed my media? One of the strengths of the Kaltura platform is the ability to see analytics on individual media entries. 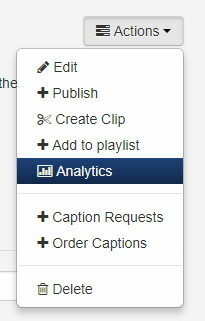 A media owner, or co-editor collaborator, can view analytics on a media file. You must be listed as a co-editor on another user's media to see analytics. A page will open showing a summary of the video and additional options. The default view is the last 30 days. 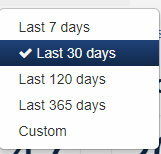 You may hover over the arrow to the right of 30 days and select a different time frame. Note that the longer, or older the time frame, the longer it will take to display viewing data. total number of Visits to the media (across all publishing locations). This will represent how many times the video was seen on a page. Additional tabs will display analytics based on categories where the media appears and individual viewer stats. If a video is password protected, the name of the viewer will appear in the viewing data, along with the number of views they have for that media asset. If a video is in a public gallery, or Unlisted, viewers will appear as Anonymous. Viewing time is based on the number of recorded minutes someone watched, regardless of the viewing speed. For example, if one person watches 100% of a 2 minute video at 1x speed, and another watches 100% of the same video at 2x, each will show as having watched 2 minutes of the video, even though viewer 2 only took 1 minute to watch the media.